Alan Davidson has more reason than most to savour the prospect of playing in an Irish Cup final, having experienced the highs and lows of local football's premier knockout competition in recent seasons. 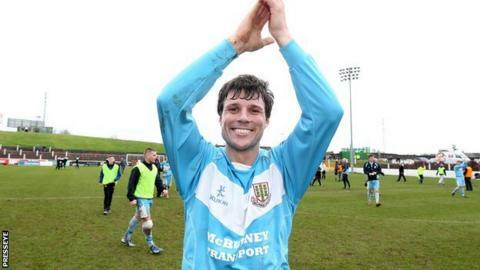 In 2012, the midfielder found himself at the centre of a registration row which denied the Sky Blues a semi-final place after he had scored the winning goal in their quarter-final victory over Newry City. Two years on, Davidson struck twice in United's 3-0 semi-final win against Queen's University to book a place in Saturday's decider against his former club Glenavon at Windsor Park. "It's been a bit of a topsy-turvy season for me personally, but I have found some form recently and hopefully I can play a part in the final," commented the 25-year-old. "Everyone at the Showgrounds is very excited - the mood in the camp is good, but we are all focused on the job in hand. "I love playing for Ballymena - there are no cliques and the cameraderie in the changing room is like no other club I've been at. "Like many of the players in the squad, this will be the biggest day of my football career so far and it's refreshing to see two big provincial clubs going head to head in the showpiece occasion of the season." The carpenter was recommended to Ballymena manager Glenn Ferguson by his former Newry City team-mate Chris Morgan, who believes the attacking midfielder has the potential to play a major part in Ballymena's future if he can add more consistency to his game. "This cup run can act as a springboard for more progress in the future," argued Davidson. "The Board know what direction Glenn wants to take the club and hopefully they will back him all the way. "I think we surprised a lot of people by beating Linfield at Windsor Park in the sixth round, but we knew we were capable of a result like that. It was nice to score two goals in the semi-final but the most important thing was to get through." Davidson's career with the Braidmen began on a much less positive note when he was identified as the ineligible player who took part in that 2-1 quarter-final success over Newry, resulting in their eventual expulsion. An initial successful appeal offered United hope of a reprieve, but a subsequent appeal from Newry saw them thrown out of the competition, the powers-that-be confirming that he had been signed after the 31 January deadline for the latter stages of the cup. "It was a bit of an emotional rollercoaster for me as we were in and out of the competition a couple of times, with appeals being overturned before a final decision was reached. "I felt at a bit of a low ebb, very deflated, as it seemed to boil down to a misunderstanding between the IFA and the club, who were sure they had received confirmation that I could play." Davidson went on to play a decisive role in Ballymena's first trophy success since 1989 when he coolly slotted home the winning spot-kick in a penalty shoot-out success over Linfield in the County Antrim Shield final of November, 2012. "That was a happier day and helped to erase the memory of that aborted Irish Cup run. It was great to score the winning penalty and end that long barren spell for the club, but I was more pleased with my overall performance on the night." So blue will be the colour in south Belfast on Saturday, with the only question being which shade of ribbons will be decorating the trophy come the final whistle. The decider sees Ferguson (44) pit his wits against his friend and fellow former Northern Ireland international Gary Hamilton (33), both managers having used their extensive knowledge of the local game and some astute recruitment to boost the fortunes of their respective clubs in recent years. Former Ards, Glenavon and Linfield goal-scoring hero Ferguson has five winners' medals to his name from nine final appearances as a player, while Hamilton picked up his only Irish Cup gong in the colours of Portadown in 2005. The Lurgan Blues are chasing their first Irish Cup final victory since 1997, when Tony Grant emerged as the match-winner, while Ballymena last tasted success when Paul Hardy netted their winner against Larne at the Oval in 1989. Both sides have the added incentive of a rare sortie into European football to look forward to should they prevail at the national stadium.